In late 2026, wealthy industrialists rule the vast city of Metropolis from high-rise tower complexes, while a lower class of underground-dwelling workers toil constantly to operate the machines that provide its power. Sound familiar? 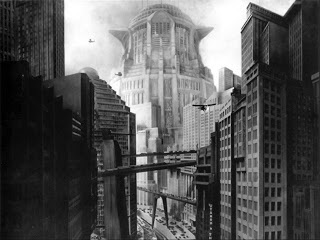 Well it should as it is the plot from classic German Expressionist Science-Fiction film Metropolis. 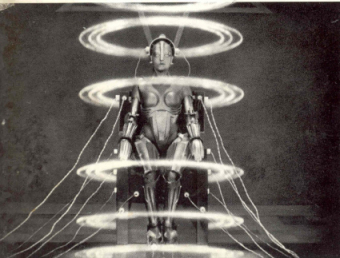 Directed by Fritz Lang in 1927 it is arguably one of the most influential Science Fiction (SF) films of all time. 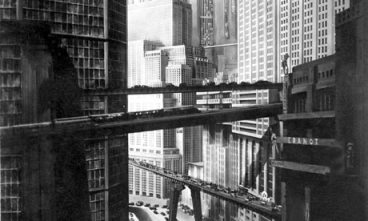 To surmise, Metropolis tells the melodramatic story of a workers’ revolt set in a futuristic dictatorship. The ruling class of Metropolis live in decadent luxury above ground while slave -like workers toil in unbearable conditions below. In the film, Maria, one of the worker’s daughters, is the leader of the workers’ liberation movement. The scheme hatched between the Master of Metropolis, Joh Fredersen, and a mad scientist named Rotwang is to undermine the workers’ liberation movement and to discredit its leader Maria by infiltrating the workers’ ranks with an agent-provocateur, a cyborg-double of Maria. The scientist creates a robot to replace the flesh and blood woman called Maria with a robotic Maria double. The false Maria begins to unleash chaos throughout Metropolis, driving men to murder and stirring dissent amongst the workers. This scheme backfires when the cyborg, acting in defiance of its programming, leads the workers on a rampage to destroy the machines that enslave them. But by destroying the machines, the workers flood their homes and nearly drown their children. Stability is restored at the end of the film after the workers burn the cyborg and the ruler’s son, Freder, assumes the role of mediator between the workers and the ruling class. 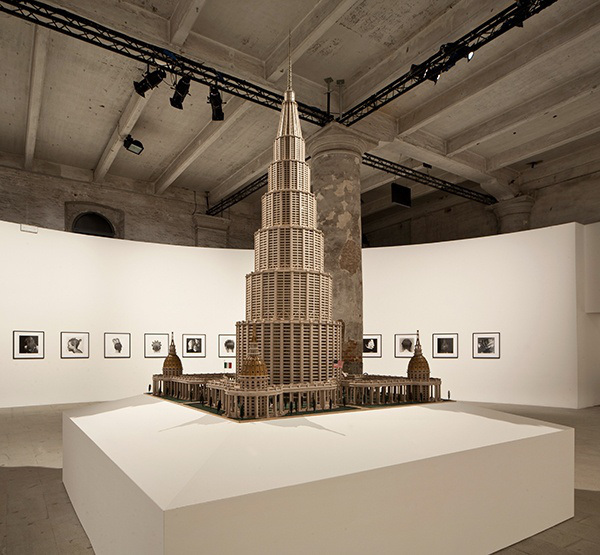 The theme of the 2013 Biennale, (from June 1 to Nov. 24) “The Encyclopedic Palace,” is a phrase drawn from the title of a symbol of 1950s-era Futurism, an 11-foot-tall architectural model of a 136-story cylindrical skyscraper. The Futurist artists, led by F.T. Marinetti from 1909 to 1944, reviled the past until their fantasies — about the beauty and proliferation of machines — became a reality and an ideal by which to transform Italian society and identity. The Fascists, led by Benito Mussolini from 1919 to 1945, focused on regenerating a corrupt Italy through cultural, political, and military means. The Italian Fascists and Futurists used the Venice Biennale exhibitions from 1928 to 1942 as a cultural platform to demonstrate the key aspects of their mutually supportive ideologies. Under Fascism, the Biennale became the perfect forum for the two groups to cultivate and challenge Italy’s aesthetic and national identity at home and abroad. By the 1930s, they appealed to both creative and combative sensibilities of the Italian people, using a shared propaganda, imagery, and activist strategies. Redefining their goals and taking on new ideals and practices that accommodated the strident and eventually oppressive nationalism of Fascism, the Futurists demonstrate how the Biennale, which had started in 1895 as a showcase for international artistic competition, and a promotion of Nationhood had, by 1928, transformed itself into a singular, prestigious platform for Fascist propaganda. The Encyclopedic Palace was intended by its creator as a model for a building to be constructed on the National Mall in Washington. It is easy to see the similarities between the cityscape of Metropolis and the high-rise tower complex model. Created by the self-taught Italian-American artist Marino Auriti, The Encyclopedic Palace, now belongs to the American Folk Art Museum in New York. “It’s the crazy dream, bordering between knowledge and madness, image and imagination,” Mr. Massimiliano Gioni, director of the 2013 exhibition has said, and appropriate for the Biennale because it reflects the grand ambition of this international exhibition. Mr. Gioni added that he hoped the spirit of Auriti’s work would encourage contemporary self-taught artists to join the international mix at the Biennale. Artist Tom Estes has taken up the gauntlet graciously offered by Gioni and in the performance work EMOTICON, he considers the future of biological intelligence in a world of distributed machine intelligence. In the performance EMOTICON @ The Encyclopedic Palace, which took place in the Arsenale durring the Venice Biennale, Tom Estes explores the use of hand gestures and hand-over-face cues while wearing the mask of a Cyberman. Estes is interested in the relationship between machines and humans, and the between visual link between the cityscape of Metropolis and the robotic Maria double with images from EMOTICON @ The Encyclopedic Palace are unmistakable. But Estes is a contemporary artist and while his performace work is both nostalgic and futuristic, it also provides a visual reflection on the technological advancements that are fast becoming an essential part of our civilization. The visual link between the cityscape of Metropolis and the robotic Maria double with images from EMOTICON @ The Encyclopedic Palace are unmistakable. As cybernetic technology catches up with the wild imagination of Science Fiction, the kind of dreams and fears anticipated in Science Ficition stories may also become reality. For example, today computers can already communicate with humans. Contemporary social critics often assert that technology has allowed for a “disciplinary” society and the pervasive inclination to observe and normalise. Cyberspace, once believed to be the dawn of a new era of communication and freedom is becoming an increasingly efficient tool of surveillance with which people have a voluntary relationship. Social networking sites like Facebook deal in self-aggrandizement and self-invention. It’s all become a fantasy expedition helmed by the ultimate avatar: a digital version of your idealized self. In the episode “The Age of Steel”, Dr. Who is able to defeat the Cybermen by shutting down their emotional inhibitors, enabling them to “see” what had become of them. Their realization of what they had become led them to either simply shut down out of sheer horror, or partially explode. So despite Estes’ performance having a seemingly light-hearted appearance, it demonstrates the serious implications posed by new technology and our physically disconnected contemporary lifestyle. But can computers understand emotions? Can computers express emotions? Can they feel emotions? New research reports that computer will soon be able to recognize hand gestures during unvoiced speech using surface Electromyogram (sEMG). Electromyography (EMG) is a technique for evaluating and recording the signals of human or animal movement. This line of research proposes different methods for identifying facial movements and hand gestures, which can be useful for providing simple commands and control to computer. The results indicate that there are possible applications of this research include giving simple commands to computer for disabled, developing prosthetic hands and the use of classifying sEMG for Human–Computer Interaction (HCI). Engineers building artificial intelligence, such as image-recognition apps for smartphones, are now giving their software the ability to ask humans for help. Crowdsourcing internet sites like Mechanical Turk make this possible, along with everything from translation to navigation. Likewise, how we communicate with each other has changed. The stuff we type today looks the same regardless of who we are or what mood we’re in. Helvetica, one of the most popular fonts in the world, was designed to be neutral so it could suit all kinds of contexts. So apart from the occasional transgression into the dubious world of Comic Sans, our business memos look just like our love letters, which look just like our complaints to the editor. To balance out all this sameness, people often resort to exclamation marks, ALL CAPS, smiley faces, and sometimes even Hello Kitty emoticons, which can have the effect of making us seem like a squealing teenager. This is reflected in Estes’ performance in which he explores the use of hand gestures and hand-over-face cues while wearing the mask of a Cyberman from the British television series Dr Who. In the show Cybermen were a wholly organic species of humanoids, originating on Earth’s twin planet Mondas, that began to implant more and more artificial parts into their bodies as a means of self-preservation. This led to the race becoming coldly logical and calculating, with every emotion deleted from their minds. Fictional cyborgs are often portrayed as a synthesis of organic and synthetic parts. In Science Fictional cyborgs frequently pose the question of the difference between human and machine as one concerned with morality, free will, and empathy. And in a strange twist of logic the title of the peformance work “EMOTICON” is, much like a cyborg, the combination of two or more elements to create a single new element. The word ‘emoticon’ is what is known as a ‘portmanteau‘ because it is a combination of ‘emotion’ and ‘icon’. For his performance artist Tom Estes takes this meaning forward, combining the hand to face gestures that provide visual clues to ‘emotions’ and fusing them with the highly stylized or ‘iconic’ hand gestures found in Voguing. In his performance Estes enacts a number of gestures that can generally be sorted into two categories. Co-speech gestures which are the idiosyncratic, often unconscious ways we move our hands as we talk (Researchers believe these gestures help us think and speak and even learn) and emblematic gestures which are the culturally codified motions that we use to supplement or substitute speech (ex. the peace sign, the thumbs-up, the raised middle finger- these gestures are symbolic, and in many cases imitative). As with slang or new words, we tend to pick up our hand movements from the groups with whom we communicate most frequently—especially our peers. If your friends are thumb-texting at you, you will thumb-text back at them. Soon enough, the movement of your thumbs can be done without speech, and people know what it is. That’s the definition of an emblem. 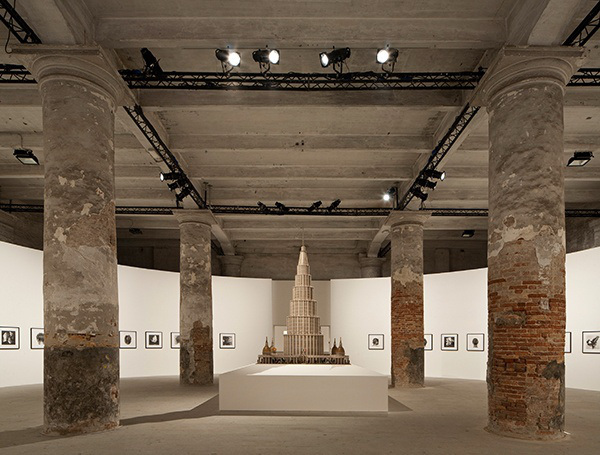 The Encyclopedic Palace of the World, Marino Auriti, (Il Enciclopedico Palazzo del Mondo) c.1950s, installation view, Arsenale, Venice. Relatively speaking, in terms of communication, textual ubiquity is brand new. Thanks to millions of years of evolution, we are genetically wired to respond differently to visuals than text. As far back as the days of cavemen, humans have used visuals as mechanism to suppliment storytelling. In their wall paintings, early man sought to discuss successes and failures, foibles and virtues. And long before online bulletin boards, people used to pass on their histories by word of mouth. How they communicated went beyond just the words they spoke; body language, eye contact, tone of voice and even smell added signals that gave their words a much wider and more nuanced spectrum of meaning. “…unless our words, concepts, ideas are hooked onto an image, they will go in one ear, sail through the brain, and go out the other ear. Words are processed by our short-term memory where we can only retain about 7 bits of information (plus or minus 2). This is why, by the way, that we have 7-digit phone numbers. Images, on the other hand, go directly into long-term memory where they are indelibly etched.” Therefore, it is not surprising that it is much easier to show- for example, a circle than describe it. Throughout his practice Estes has created socially engaged performance work that is both participatory and immersive, while at the same time playfully messes with habitual ways of thinking. During his performance, audience members were asked to interact by taking pictures on what the artist calls a “communal camera”. The pictures were then posted on social networking sites for another, wider on-line audience. This is what Estes refers to as ‘Harnessing The Hive‘ – as the view of the central performance is mediated by humans but digitally recorded through machines. The term ‘Harnessing The Hive’ comes from the Theory of Collective Intelligence which describes a type of shard or group intelligence that emerges from the collaboration and competition of many individuals and appears in consensus decision making in humans and computer networks. So in the performance, the ‘hive mind’ is referenced not only via the Cyberman mask from the science fiction television show but also through the active participation of the audience. By merging everyday technology and the absurd, Estes strives, not to break down the introverted, often self-imposed boundaries between the fictional and the real but instead uses the fictional as a reflection on how data flow impacts on the significance and symbolism of real-world human senses. The term cyborg is often applied to an organism that has enhanced abilities due to technology. The idea of the cyborg dates back as least as far as Edgar Allen Poe. In an 1839 short story, he told the tale of a wounded war veteran whose body was rebuilt using synthetic parts, including the “handsomest pair of whiskers under the sun”. Other writers have imagined a similar future, albeit with less emphasis on facial hair. In the last few decades the image and the idea of the cyberman has evolved remarkably from an awkward, mechanical creature to a sophisticated cyborg with artificial intelligence and the potential for human-like consciousness. Indeed, even the fantasy of intelligent brain-implants may become real as researchers are currently devising electronics to revive lost memories. By donning the mask of a Cyberman, Estes questions the relationship between humans and a new cultural mechanisms capable of eclipsing the analytical capabilities of our own species. For example The Centre for the Study of Existential Risk (CSER), a project associated with the University of Cambridge, proposes a study that will examine the risks to humanity posed by artificial intelligence, biotechnology and nanotechnology. Those behind the effort—philosopher Huw Price, cosmology and astrophysics professor Martin Rees and Skype co-founder Jaan Tallinn—say that they are attempting to forge a scientific approach to studying what are considered, by the popular mind, science-fiction-like scenarios. Huw Price says ”It seems a reasonable prediction that some time in this or the next century intelligence will escape from the constraints of biology”. CSER is scheduled to launch next year. The Centre for the Study of Existential Risk is being co-launched by astronomer royal Lord Rees, one of the world’s leading cosmologists. It will probe the “four greatest threats” to the human species, given as: artificial intelligence, climate change, nuclear war and rogue biotechnology. Similarly, in Metropolis, the cyborg-Maria is not just the embodiment of the voluptuous vamp who leads men astray, but becomes a potent and disruptive social force, a machine who nearly tears down the barriers that constrain social possibilities in Metropolis. When Rotwang first introduces his robot to Fredersen it is little more than a mechanical toy. Made of shiny metal, it is essentially an industrial robot, a docile and obedient machine. We see it obeying Rotwang’s wishes, following his instructions. But we have reason to suspect total control when we learn that Rotwang has lost a hand in the construction of the machine, indicating the threat of the machine. Though it bears feminine features, it is at this point asexual. As a metallic robot, it inspires the kind of awe and fear evoked by industrial machinery. This is reinforced when it extends its metallic hand to Fredersen and we see him recoil in fear and horror. It’s construction as machine-woman, a subversive cyborg, is shown in three distinct stages: we first see it as an obedient machine, then we watch it’s fusion with the Maria, transforming it into a cyborg. The third stage shows the cyborg as a social and cinematic construction and as a sexually alluring and dangerous replacement for the original. But what does all of this have to do with art? At the McTaggart lectures in 2011, Erik Schmidt, Chief Executive of Google proposed that the next great innovations in the digital field would only come if the ‘luvvy’ and the ‘boffin’ begin to work together. Artists have long been experimenting with and working alongside different scientific fields, trying to explore the potentiality of such exchanges; indeed new and applied technologies have often been implicitly embedded in these collaborative ventures. But as well as aiding scientific discoveries, productive interactions between performance and engineering, mathematics, neuroscience, biology and computer science bring to our attention the question of how science impacts our daily lives. This too could be seen as a reflection on the role of artmarket itself. The Factory style of artists like Damian Hirst represent a colossal break from traditional approaches to art production and consumption. Traditionally contemporary art offtered a kind of mirror on society- the voice of the individual within a corporate structure in which decisions are made by committee. Art was often characterized as an alternative to right-wing mainstream by offering a left-wing perspective. However today, the combination of brand management and a market-oriented focus has effectively replaced inherent subjective value of art, its appreciation and aesthetic quality as a driver of value, and even the artistic ability and skill required in its production with a focus on brand. Manipulation of buyer’s preferences and demand, and influencing the art market itself through commercial ability has over-ridden any politically aware dialogue. Hirst could be considered one of the most market-savvy artists of all time, as there is arguable little correlation with the quality of his work and the astronomical prices he regularly commands. In fact, often Hirst has little, if any, involvement in the actual production of his art. He employs an army of “assistants” who utilize Hirst’s easily replicated framework to create many iterations of established models of art, which then command exorbitantly high prices in market and auction settings. The combination of these factors threatens to replace true artistic value with mass consumer-manipulation and the destruction of traditional role of art. Estes’ principle concern, then, is how in an over-heated, market obsessed society, our view of life is increasingly mediated by machines and the digital as a shaping condition and structuring paradox. But this is not the first time that art has been used to promote a particular ideology. For decades in art circles it was either a rumour or a joke that The Central Intelligence Agency (CIA) used American modern art – including the works of such artists as Jackson Pollock, Robert Motherwell, Willem de Kooning and Mark Rothko – as a weapon in the Cold War. It is now confirmed as fact by former CIA officials. Donald Jameson has come forward and admitted the agency saw Abstract Expressionism as an opportunity, and unknown to the artists, the new American art was secretly promoted under a policy known as the “long leash“. In the manner of a Renaissance prince – except that it acted secretly – the CIA fostered and promoted American Abstract Expressionist painting around the world for more than 20 years. Why did the CIA support them? Because in the propaganda war with the Soviet Union, this new artistic movement could be held up as proof of the creativity, the intellectual freedom. Technology has changed the way we think from the rise of modern economics― based on algorithms of marketing and fictional currencies to advanced capitalism’s smooth, self-sustaining art world as infinitely reproductive and fictional as the currencies pinging across digital networks. Value is no longer indexed to the material production of goods, or to any inherent meaning, but extracted from the digital circulation of signs. The work begun on the study of the human mind begun by Sigmund Freud was intended as a means to help humanity. However these have been adapted to manipulate and manage the world through advertising, public relations, and politics―in turn bringing us the modern world of hyper-consumerism. Freuds legacy is an idea that would dominate politics in the twentieth century―that the dangerous desires and irrational impulses of individuals could be managed on a large scale by objects that reflected and fulfilled those desires: consumer goods. But science and technology are quickly catching up to the dreams of Science-Fiction. And if technology is a drug – and it does feel like a drug – then what, precisely, are the effects as well as the side-effects? So while machines may enable us to do things, they also do things to us and do things at us. We are being completely enveloped by abstract systems and inundated with information that we are struggling to come to terms with. So perhaps the question is not how much computers are becoming like us, but how much are we becoming like computers?